We have been strong advocates of the premise that renter household formations will continue to capture a larger percentage of overall household formations. 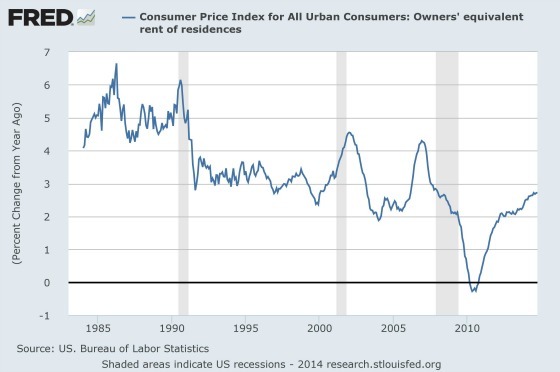 Clearly the United States economy became irrationally focused and reliant upon homeownership during the bubble days of 2003-7. While we knew that apartments would not stage any type of meaningful recovery while the economy was contracting from 2008 through 2009, we did believe that apartments would perform quite well once a recovery took hold. The excesses in mortgage lending would not be tolerated and credit would be much harder to come by. This, combined with the very devastating financial losses incurred by so many Americans on their homes, would serve to push many more people into renting than in the past. 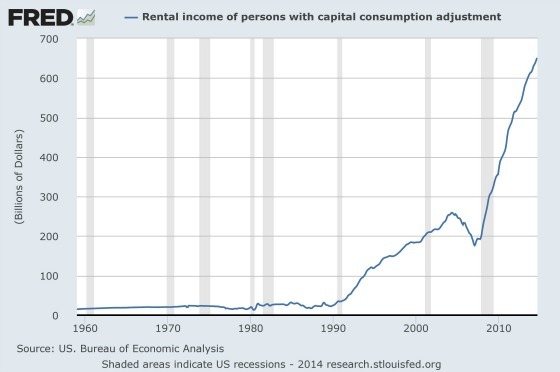 This has clearly been the case as vacancy rates have dropped, rents have increased, and landlords have been collecting a lot more rental income as the following graphs show. 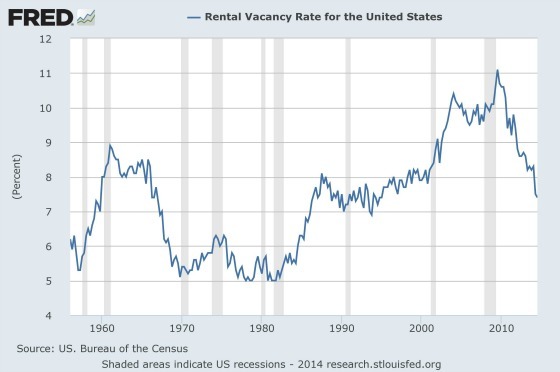 Rental Vacancy Rate for the U.S.
Clearly the last four years have been very kind to apartment owners. The question of course is where do we go from here? I recently read an interesting report from the Kansas City Fed about the future demand for housing. The report is entitled The Demographic Shift from Single-Family to Multifamily Housing and was written by Jordan Rappaport. Like CWS, Rappaport believes that the United States is not producing enough housing to meet the demand. From his analysis of demographic trends, he believes that there is a deficiency of 1.6 million single-family homes (equal to 2.0% of the single-family housing stock) and 1.5 million multi-family units (equal to 4.8% of the multi-family housing stock). The Great Recession clearly threw off the trajectory of household formations. The key question is whether the people that moved back home will leave over time and form new households. Rappaport believes they will and that these gaps should close over time due to improving labor market conditions, increases in household wealth, and further home price appreciation. He then uses three different scenarios to forecast future construction trends for each type of housing. There’s a baseline, optimistic scenario, and pessimistic scenario. He concludes that multi-family should make up most of the gap. 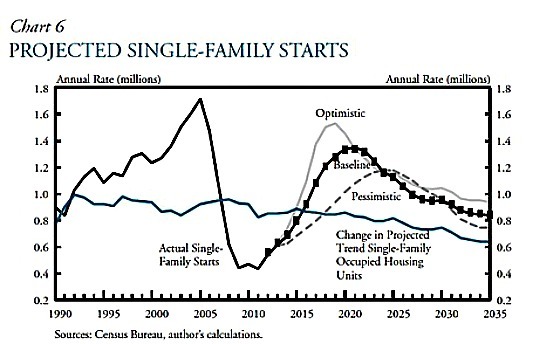 Single-family should be relatively strong as well for the next few years, but drops off quite a bit after that while multi-family construction should remain at higher levels than we’re experiencing today under all three scenarios over the next 15 to 20 years. Baseline – Starts peak at 1.35 million in 2021, nearly identical to their level at the start of the housing boom in 2002. Starts contract thereafter, down to 950,000 in 2030. The gap grows to 2.4 million units in 2016 and is 98% closed by the end of 2030. Optimistic – Peak of 1.5 million in 2019. Growth turns negative in 2020 and remains so through about 2031. The gap is 98% closed then. Pessimistic – Starts peak at 1.2 million in 2024 and contract through 2032 which closes the gap by 99%. Multifamily should make up a lot of the gap. Even the pessimistic assumptions results in multi-family construction being strong compared to its historical rate. Historically, multi-family starts have been in the 300,000 to 350,000 range. 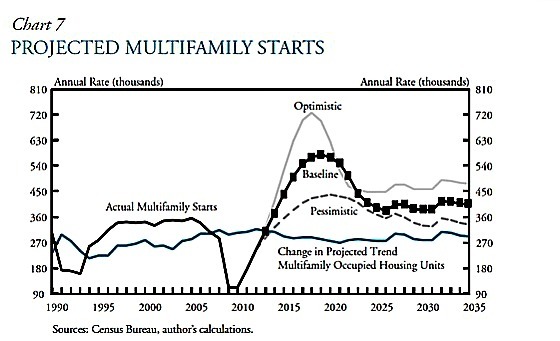 Under all three scenarios there is a meaningful projected increase in multi-family building and even when they begin to drop and plateau, the lower levels of activity are still modestly higher to significantly higher. Of course it’s possible that the current 1.5 million gap doesn’t close over the next 15 to 20 years but that does seem like an unrealistic assumption given our culture, improving economy, and a stable to growing housing market in terms of property values. These projections tend to corroborate our belief that apartments should be a solid investment for the long term. Is the gap closing? The Demographic Shift from Single-Family to Multifamily Housing so could Multifamily Housing be the future demand for housing?